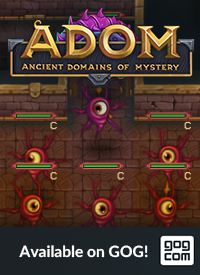 SPOILER ALERT: ADOM has sharks. And some other marine wildlife. Sharks are one of those creatures where ASCII and graphical versions of the game are really at odds when it comes to how difficult it is to depict the creature. it moves in the "depth" plane rather than horizontally or vertically relative to the "camera". That means our limb-based movement animation is just no good. Custom frames are a must. "Depth" (or z-axis) based movement is really tricky to get right. We want to get the sharks body to visibly bend, but at the same time the silhouette will remain largely unchanged. Not an easy feat! Better! The movement feels quite fluid. But still looks like a flat sprite oddly bending ;) Here I decided to simplify the sprite to remove some rough changes between frames. This is much better, but to be honest I'm still considering if this good enough. One thing is the gif above doesn't quite give the lovely sharks justice. They feel better in-game as the timing in the gif above is slightly off(many pardons for that). Still, this might be one of those sprites we return to ;) We'll decide based on feedback from the animation test version. Hopefully sooner than later! Still, hope this was an interesting insight into some of the more exotic animation challenges. PS. As the big announcements come closer, I hope Lucas, our tireless sound magician, will join us here on the blog next week. 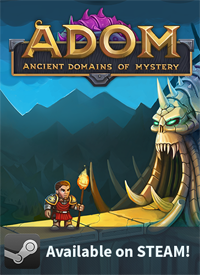 We've had comments here and there asking what it's like to make ADOM sounds. Might be a good moment to show off the new weapon sounds perhaps? Awesome stuff! Can I challenge you a bit more? How would you paint aquatic monsters if this great RFE is implemented? 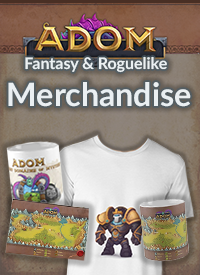 No plans for that yet :D That's more a request aimed @ Thomas, as with any content changes.